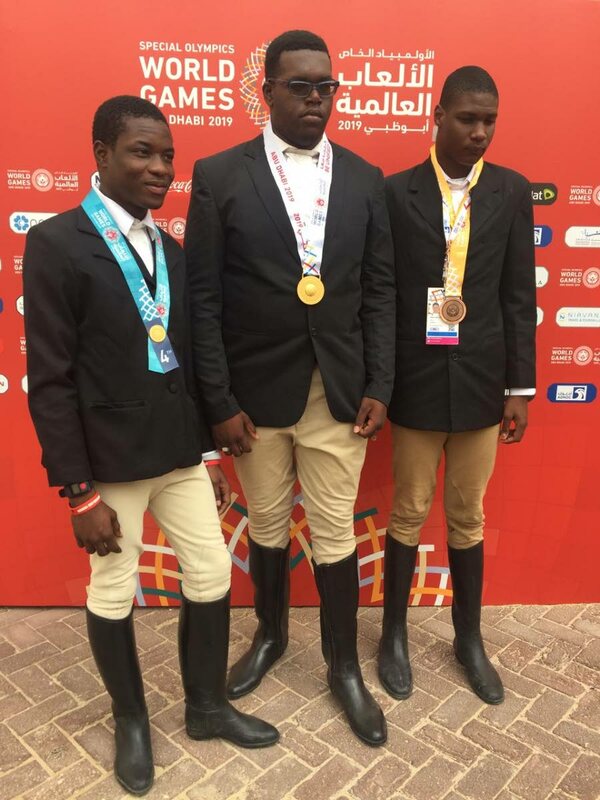 Equestrian athletes (from left) Romaldo Stafford, Aaron Ben Ali and Omari Peterson won medals yesterday for Special Olympics TT at the World Games. SPECIAL Olympics TT's (SOTT) medal count soared again yesterday with two more gold medals. Israel Duncan won the 50m sprint and Aaron Ben Ali won his equestrian event as the 2019 World Games in Abu Dhabi, United Arab Emirates continued. In addition to the two gold, SOTT also picked up two silver and three bronze medals and placed fourth in two events. SOTT now has seven gold medals, four silver and one bronze. Duncan became one of SOTT's latest heroes at the Police Club Stadium, crossing the line first in the 50m run in 14.65 seconds. He finished ahead of Kirk Wint of SO Jamaica (15.06 seconds), and Adrian Sharbani of SO North Macedonia (15.12 seconds). Israel Duncan won 50m gold at the Special Olympics World Games yesterday. SOTT's Justin Providence took bronze in his 200m event, clocking 26.21 seconds. He trailed gold medallist Obrian Mcfarlane of SO Jamaica (24.08 seconds) and silver medallist Freddy Andrade of SO Ecuador (25.56 seconds). Jonathan Walker also earned bronze for SOTT, finishing the 200m in 26.38 seconds. Hector Lindao of SO Peru won in 26.18 seconds. At the Hamdan Sports Complex, Nikoli Lalla earned silver for SOTT's swim team in the 50m breaststroke, clocking 38.96 seconds. Scott Bissett of SO Canada won in 36.41 seconds. At the Abu Dhabi National Exhibition Centre, Gary Boodoo claimed his second silver medal in bocce singles, defeating his opponent from SO Lebanon, 12:0. SO Andorra went on to win the gold medal match 1:10. Bernard Singh finished in fourth in bocce singles and in the process earned an 8:8 draw against eventual silver medallist Taha Alghawi of SO Libya. Alicia Khan began her singles competition, winning her game 12:1 against Amphayvone Boundavong of SO Laos and is grouped with team-mate Shanice Baptiste. Baptiste was reportedly able to overcome "severe flu-like symptoms," which she was battling over the past several days, in order to compete. She, however, lost 0:6 to SO China's Jing Wu. In equestrian, SOTT continued its exceptional form in the varying divisions, with the trio of male riders matching the success of their female compatriots. 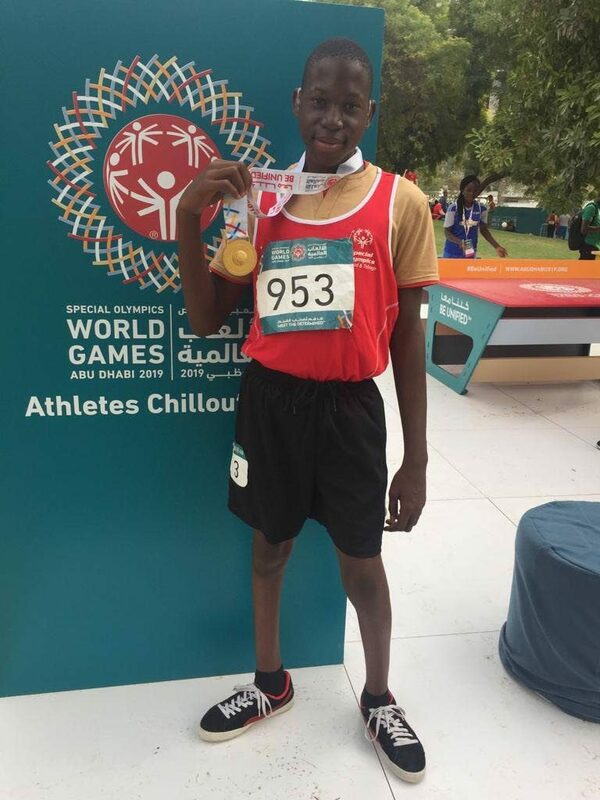 At the Al Forsan International Sports Resort, Ali, on W’rsan, earned 58 points to claim gold in his BI Level Working Trails competition ahead of Australia's Willow Hersant (51 points) and Wafaa Al Kindy of SO UAE (50 points). Omari Petterson, riding Miss Poly, was able to claim a bronze medal by earning 45 points to tie with Marie Stuart of SO Great Britain. Darlene Milord of SO Haiti claimed gold with 52 points. Jacek Czarnecki of SO Poland took silver (47 points). SOTT's Romaldo Stafford on Dimpson earned 49 points to achieve fourth place. Reply to "Special Olympics TT medal tally soars"